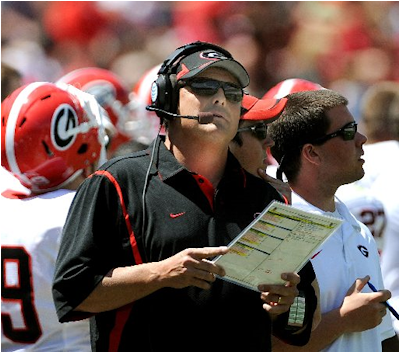 Neil Cornrich & NC Sports, LLC: Georgia Bulldogs DC Todd Grantham: Do The Dallas Cowboys Miss Him Or What? Georgia Bulldogs DC Todd Grantham: Do The Dallas Cowboys Miss Him Or What? When the Georgia Bulldogs hired Dallas Cowboys defensive line coach Todd Grantham as their new defensive coordinator, the biggest question was how long it would take the Dawgs to convert from Willie Martinez' carefree 4-3 system to Grantham's particularly aggressive 3-4. Despite serious growing pains along the way, Georgia's defense is better than it was a year ago, record be damned. But how about Dallas' defense without Grantham? They haven't had to switch their style up at all, retaining head coach and lifelong 3-4 man Wade Phillips as defensive coordinator and returning their former linebackers coach Paul Pasqualoni to take over the defensive line. Despite that, Dallas' defense is worse this year. You may have heard they're 1-6, and that's not entirely the offense's fault. Through seven games, the Cowboys have given up 187 points. After seven games last year, they'd given up 136. That's over a touchdown per game difference. They finished 2009 with the NFL's second-best scoring defense; this year they're 27th. How much of that is really due to the loss of Grantham? In 2009 Dallas was seventh in sacks and ninth in yards per rush, Grantham's two biggest areas of responsibility. So far this year, they're 14th and 24th respectively. And that's with Cowboys OLB DeMarcus Ware's eight sacks, currently tied for second in the league. Minus Ware's talent, Dallas might have the NFL's worst pass rush, as their total would be neck-and-neck with the Tampa Bay Buccaneers, Minnesota Vikings, and Cincinnati Bengals. Last year they would've ranked 23rd without Ware. Sure, Dallas has been banged up, especially in the secondary. But that was the case last year too. Meanwhile Georgia's run defense has improved by over ten yards per game, while their sacks per game are up ever so slightly. The Dawgs' defensive stud has been Justin Houston, who has nine sacks. Mel Kiper calls him the best 3-4 outside backer in this year's draft class, assuming he goes pro. While Houston was already a force, collecting nine sacks in his first 21 games, Grantham's system has been a perfect fit. Despite his job title Grantham coached Ware and other linebackers at Dallas, and Houston immediately bought into playing in Ware's role at Georgia. Yes, Grantham's often a raging hothead. But we've known that since day one. In fact, appreciated it on day one. Don't you think the Cowboys could use a little bit of that fire right now?